Personality is defined as the sum total of the physical, mental, emotional, and social characteristics of an individual. When a business builds up a wide range of people with different personalities they will gain varied viewpoints, increased adaptability and higher productivity. 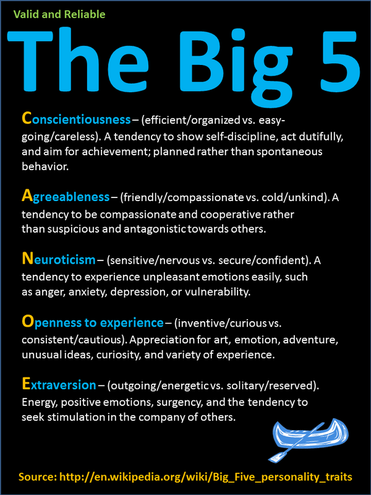 The best way to describe the different types of personalities is to use the “Big Five Model”. Businesses choose people based on a combination of high scores in different categories. Many times, employers use online survey/personality tests that you have to take to be able to apply for the job. "Employers often use the big five model to classify the different personalities and hire the ones that would work well together" (Woody). This is one way that personality diversity is achieved. In addition, personality diversity can happen naturally. When you hire multiple people for a job they are going to have different personalities, however it has been said, “Different personalities can motivate one another, while similar personalities may actually prove to be detrimental” (McFarlin). This is true because no one likes to work/talk to someone that is the exact same as them in every way. If you just let personality diversity happen naturally, chances are that you are not going to get the best mixture of personalities that strengthen one another. Lastly, an employer can get to know someones personality during a job interview (Clark). If they think the applicant will fit in well, then it would be a good idea to hire them. When you are staffed with a mixture of physical, mental, and emotional characteristics, you are going to have many different ideas/viewpoints of how to accomplish tasks. This is a very good thing to have because it creates different possibilities for solving problems. “A diverse workforce that feels comfortable communicating varying points of view provides a larger pool of ideas and experiences” (Diversity in the wokplace...). “Teams often comprise six personality types – the stabilizer, adventurer, driver, cheerleader, perfectionist, and energizer. The latent and dominant characteristics of these personalities combine to create a diverse team that provides different traits that work together successfully” (Ylisela). When you have this diverse team, each individual feels able to adjust to readily different conditions due to the support of their coworkers. “Employees from diverse backgrounds bring individual talents and experiences in suggesting ideas that are flexible in adapting to fluctuating markets and customer demands” (Diversity in the workplace...). 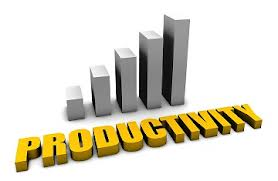 Businesses with diverse personalities always have higher productivity. “A combination of personalities can create a stronger, more balanced environment. A mix of personalities helps compensate for individual strengths and weaknesses for greater overall strength” (Ylisela). What this means is different people are going to be better at doing different things, so if everyone does what they do best, then productivity would be maximized. “Employee morale are changed within a company” (McFarlin). When you have a team with diverse personalities, emotional and mental conditions are usually more cheerful and confident during tough times due to the support from the varied viewpoints and adaptability of others. Hiring the correct people is one of the biggest ways that you are going to gain personality diversity. However, there are other things that can be done to improve or accumulate a diverse staff. “Create a positive work environment” (Ylisela). If you have a positive work environment, others will feel more comfortable to express how they are feeling and the ideas that they possess. This will get them to open up more and show their personality. “Launch a customizable employee satisfaction survey that provides comprehensive reporting” (Diversity in the workplace...). If you get feedback on how your employees feel about certain situations then you will be able to fix/change any problems within the company.